Using the key menu you can choose the key to be used for the rest of the tune. 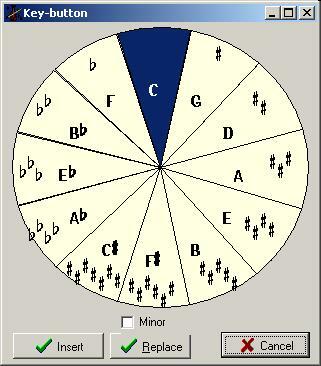 You are presented with the so called circle of fifths where all related keys are shown in a musically meaningful way. Use the arrow-keys or mouse to select the desired key, and press either the insert-button or replace-button to insert a new key at the cursor position or change the previous key (which may be at the tune's beginning).